The Atlantic Ocean is your backyard! View the most spectacular sunrises from this beautifully decorated first floor end unit condo. Walk out your private screened porch to enjoy the sand between your toes!! Excellent furnishings with remodeled kitchen, new appliances, granite counter tops. Newly remodeled Bathroom with Walk-in Shower, washer/ dryer, digital cable,,2 TVs, HDTV in Bedroom,30" Flat screen in Living Room, wireless Internet, Lazy-Boy sleeper sofa and screened porch. Linens included. No smoking. No pets. Bedroom 1: King bed, HDTV, glass doors leading to spacious patio. Living room: Queen sofa bed, HDTV, cable, internet, WIFI, glass doors leading to patio. Kitchen: Granite countertops with modern appliances, bar counter with 2 barstools. Dining: dining area 4 people in the kitchen. Patio: with dining area for 4 people, stairs leading to the beach. This was our fifth or sixth time to stay in Port O Call B101. We love this unit. We have no complaints about the unit, Island Realty staff, everything was great! We had an issue with the cable box, but within an hour someone was there to fix it, he had to go get a new modem, but was back within an hour and had everything running properly. The only complaint we have is dogs!!! Walking the beach we had to deal with dogs, not on a leash, jumping on us and others. One couple with small children had to pick their children up to get them away from a dog. The children were hysterical. The dogs owner could not control it. Isn't there a leash law??? One couple in our building had three large dogs the stayed on the porch and barked at every person walking the beach. Another dog barked for over two and a half hours straight (I assume the owners were gone). Couldn't tell for sure which unit, or I would have called. Fortunately it was our last night there, we left early the next morning. We LOVE the Isle of Palms, we have been coming for over thirty years and have staued in many different condos and a few houses. We have always thoroughly enjoyed our stay but are thinking twice about coming again because of the dogs. We don't care if people want to bring their dogs, but make them keep them on a leash and control their barking, please. Hi Don, Thank you for taking the time to write a review. It's unfortunate when people are not considerate with their dogs in public places, however, it's sounds like you love visiting IOP and we look forward to having you back. We started our vacation with another hurricane affecting the SC shore (Florence). Once again, Island Realty worked with us and we managed to check in only 1 day late and they offered us an extra day in the condo to make up for the lost day - which we gladly accepted! We cannot thank Island Realty enough for their continued professionalism and quick response to any situation that arises with our vacation stay. We continue to enjoy Port O Call B101. Such a beautiful, restful place with unmatched views of and access to the beach and ocean. We will continue to come here as long as we are able. Thank you so much for taking the time to leave a review and we appreciate your patience and understanding during the hurricane. We look forward to having you stay with us again soon! The condo above it (B201) has wood flooring and I could loudly hear the visitors’ two children constantly running and racing around all day long. I’d suggest asking the owners of B201 post a sign, asking the visitors to be considerate of the neighbors below them. Thank you for taking the time to leave a review. I passed along your suggestion to the owner and we have posted a sign. We look forward to have you come and stay with us again soon. Please don't hesitate to reach out to us if you have any questions when booking your next stay. Wonderful condo. Walk right out of back for to beach. Very clean. Comfortable bed & furniture. Will return. Hello Nancy, Thank you for taking the time to leave a review. We are so glad you had a good trip and look forward to having you back with us soon. From booking our condo, checking in, reserving beach chairs and umbrella to checking out it was one of the best experiences that we have had in vacation. The condo was very well furnished with attention to details such as usb plug for charging phones, organizers in the bathroom cabinet, and beach umbrella and chairs on back porch. You could tell that the owners were proud of their condo and wanted you to have a great experience. Thanks so much for a relaxing vacation!!! We will be choosing B101 again!! Right on the beach. About a 100 yard walk. Nice condo with everything you need. This is a very pleasant place to stay. Location is wonderful and apartment is well-kept and very functional. The nice decorations make the apartment seem very homey. The porch was a special treat and stayed pleasant even when temperatures were mid-80's. However, the check-in process could have been better. There was only one employee on duty on a Saturday at 3:15. The employee was spending a lot of time explaining possible rental locations to aprospective client. No problem - he was there first. My problem was that there was only one employee at the desk. After a few minutes, another employee came out and pretended that he did not see me or the persons who were now in line behind me. After a few more minutes, a third employee came out and began checking the rest of us in. We were so disappointed that we didn't get to come to Wild Dunes for our much needed week of rest and relaxation due to Hurricane Irma. Island Realty is the best! They contacted us to cancel our reservation and worked very hard to reschedule our trip. We have rescheduled for the spring of 2018 and now look forward to another memorable week at Wild Dunes - WEATHER PERMITTING!!! Thanks again, Island Realty, for working for your Owners AND your Renters to bring about the best solution to any problem! The place was very nice and a great location. We look forward to coming back soon. This condo is amazing. The views are spectacular. The condo comes furnished with all your needs. I recommend bringing extra toilet paper, paper towels and trash bags. The owners obviously take pride in their oceanfront beach home. The bed was very comfortable. The couch and chairs were comfortable also. The screened in back porch was perfect. Here is my complaint, it is a major one. Our a/c would not work properly. We had to go buy fans at Lowe's. We have a 5 month old that was overheating in the condo. The temperature had gotten up to 84 in the small condo. We had opened up all Windows. My poor child was sweaty and crying because she was so hot. I felt helpless. After the 3rd time calling after hours, I finally had to use some very strong ugly language. I was fed up. Around 8pm. Finally, someone came. The condenser was plugged up. After that the a/c worked wonderful. 2 days of our vacation was ruined. Thank you for your reply and do apologize for your inconvenience. Air conditioning is definitely a necessity here with the summer heat and humidity and sometimes our a/c systems are taxed with the usage and salt air. In this situation the system worked as it was designed as the condensate line was blocked and the system switched off so to alert us of the problem and prevent a leak in the condo. Our after hours A/C technician was called out and from call to completion took 4 hours to get the system up and running. We rechecked the system this week to make sure the condensate line was indeed open and unit was working correctly. I do understand the heat is terribly uncomfortable at this time of year which is why we have systems in place to address unforeseen situations quickly. We've stayed at B101 for about the last 6 years or so. Sometimes twice a year! We love it and are so grateful the Owners rent it out. So peaceful and beautiful! You can't get much closer to the ocean that this place and that's what we love most about it. Of course, the fact that it's decorated so nicely doesn't hurt. Everything is comfortable and we have everything we need. We go out to eat some (Shem Creek), but for the most part, we don't leave until our week is up. Making reservations, check-in and check-out are SO easy thanks to Island Realty. They think of everything. I highly recommend this rental! Very pleasant stay. Enjoyed the unit. Very clean and up to date. Fantastic experience! It is right on the beach-just walk out the porch door and you are there. Great furnishings, very clean and comfortable. Wonderful place for a couples' getaway! The Port O Call unit that we stayed in was awesome. Direct access to the beach straight from a screened in back porch. The weather was great, the only issue we saw some bugs in the bathroom when we arrived but never saw anymore. The condo had a musty smell need to have a better airfreshner to reduce the smell. Location is wonderful. We just walked out the door and we are on the beach. We liked the screened in porch and spent a lot of time there. The bed was firm and comfortable. The shower was walk-in so there was no tub to step over. There were a couple of maintenance issues. One I was able to fix on my own (the toilet handle became loose so the arm did not lift so water did not go into the bowl). The other issue was minor - intermittent light bulb in a lamp. There was plenty of silverware, dishes, and kitchen items. Everything was clean and neat. We enjoyed our stay very much. Very quiet and restful with lots to do in the Charleston area if you would like to sight-see. We have stayed in this unit several times. It is a beautiful place. The backyard is the beach. It's clean and quiet and we love it. We have stayed in this condo before and were extremely pleased so when we decided to plan another trip to Charleston, we decided to stay in the same place. Although we were very pleased with the location and for the most part with the condo, we did find it in need of some updates and repair. The coffee maker didn't work. The handle on the toilet was not connected properly. One of the sliding glass doors didn't lock and was extremely hard to open/close. Some of the baseboards were either very dirty or needed painting. The system of cleaning your feet seems to be unsanitary. The tub was already full of sand and water and was dirty. We also had a problem with huge cockroaches. 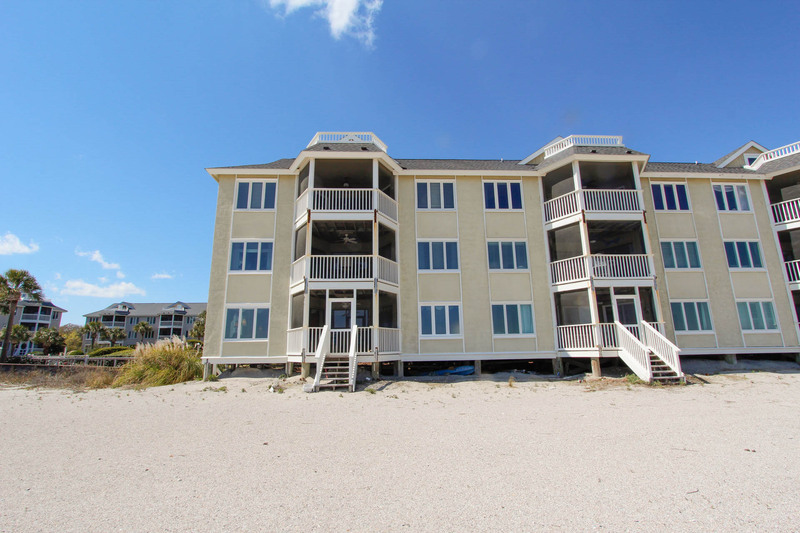 We would recommend Wild Dunes/Port-O-Call to a friend, but would fill them in on the condition and suggest they might want to look for a different condo in the Wild Dunes area. This is our 5th year staying at Port-O-Call B101 and it's as close to perfection as you can get. It's so wonderful, we hardly ever go anywhere else during our week here, except the beach and to dine out. Island Realty is ALWAYS a joy to work with and I can't praise the folks that work there enough. Thank you again for a dreamy vacation from the real world. We have rented this place several times over the years and have always enjoyed or stay. Everything was excellent. Easy check in. Everything provided for. A perfect location and view. Can't wait to come back. Island Realty extremely helpful. Condo exceptional. Beachy theme, but still the feel of home. We have been staying at Port O Call for 30 years. Overall we like the Port O Call Units. The 10 AM check out is early. Most hotels are 12 or 1PM and at over 300.00 per night that should be a given. The mattress in this unit needs to be replaced as well as the sleeping pillows. Lots of decorator pillows. But just two flat sleeping ones. Limited soap in the bathroom and no kleenex. Also one day of coffee would be nice in case you couldn't stop at store. The apartment itself was very nice, as before. But, we were disappointed in your service. When we arrived the air conditioning was not working. I turned it down and waited several hours, but still not working. So I called your office and was told to wait until Monday. Okay, I did. And it was still not working. So, we called your office again. And a general maintenance man came who didn't know how to fix it. So we had to wait for another repair man who finally fixed it late Monday. Also, we had no landline phone service. I called several times about this, but we didn't get that fixed until Wednesday. You should do better. p.s., You shouldn't make me fill in your survey betore I can send my comments. We loved the place. We could leave the doors open and feel the ocean breeze as we slept. The decoration and furniture were great even down to the pictures on the wall. We never once turned on the TV. This is our 3rd time at Isle of Palms and we plan to come back again next year!! This is the second time we have stayed at B101 and hopefully will not be our last. Check in-check out was super easy and the unit was in very nice shape. 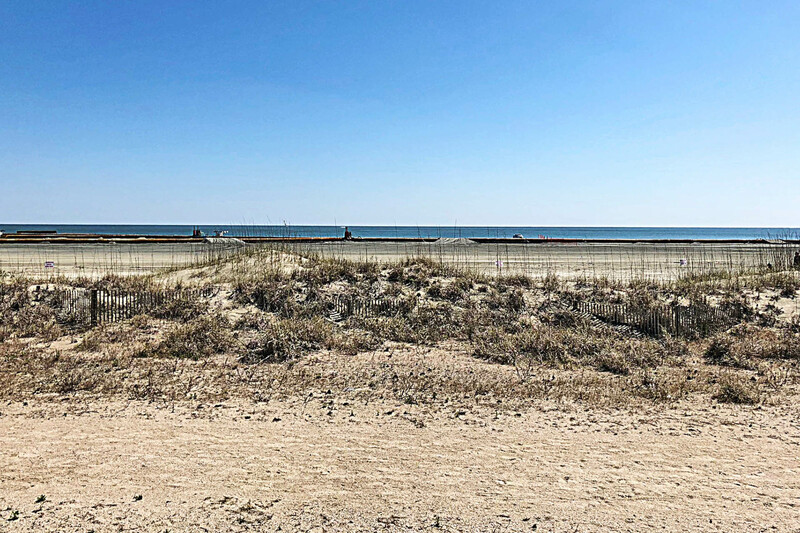 About a 20 minute drive to Charleston,two golf courses to choose from and of course the ocean right outside your back door. Excellent. One complaint, living room lighting inadequate for reading. Island Realty has always been our vacation place and this time at Port O Call was one of the best. We have stayed in this unit several times and will again. We love the view of the water! Everything was clean and in working order. We spent lots of time on the screened porch (no bugs). The only complaint we have is the sofa needs to be replaced. O.K. to look at, but very uncomfortable to sit on. We took throw pillows from the bed to sit on to give it some support. Otherwise, we love it. We have been renting through Island Realty for well over 25 years and always find the staff courteous and helpful. Port O Call Unit B101 was a very comfortable and nicely appointed unit. We appreciated the wonderful view of the ocean that we had. The comfort and location allowed us to thoroughly enjoy the time we spent at POC B101. Rental, check in and check out process were easy and exatly what is needed for vacationers. My Wife and I visited Isle of Palms in August for our 25th Wedding Anniversary. Overall our experience was positive. Island Realty was helpful when booking our unit and their communication via automated emails was very good. However, we felt that during check in and some email communications prior to arrival Island Realty was somewhat impersonal and lacked the friendly Customer Service focus. What they should realize is that although they go through this process thousands of times each year, each Customer only does this once a year if not once a lifetime treating every Customer as a number or a process to "get through" was disheartening. Our Unit Port O Call B101 was nicely decorated however, the cleaning company needs to be replaced. The floors were filthy and the kitchen and bathroom counters still had dirt from the previous tenant. The deck area had never been cleaned and the patio table was just disgusting. If you are looking for peace and quite, DO NOT RENT this unit. You can hear every step above you, and when kids are upstairs you hear them running and screaming NOT GOOD. I will say being just steps away from the beach was very nice and we did enjoy our stay overall. This was one of the best condos we have stayed in. The furnishings were comfortable, the tvs worked and it was very clean. Very glad to hear you enjoyed Port O'Call B 101 and your vacation on Wild Dunes! Thank you for choosing Island Realty! We hope to see again in the future! We have rented Port-O-Call B101 for the past 3 years and have loved every precious minute of it. What a perfect condo! End unit, screened porch that opens onto the beach. What's not to love? We hope to visit this place at least once a year. Island Realty is a top notch real estate company that makes sure your vacation goes off without a hitch. Easy check-in and check-out. I've never had to make a maintenance call for this unit so I cannot respond about their maintenance service, but would assume it is as efficient as the rental process. Thank you so much for your positive feedback! So glad to hear you enjoyed your vacation (and previous ones!) at Port O'Call B101! We appreciate your business and kind words and hope to see you again soon! This is the nicest Wild Dunes property we have ever stayed in! Our stay was very pleasant.The only concern we had was with the HOA lady's email .I did not take my computer on this trip.When I arrived home and checked my emails I had a nasty little email from was concerning the kiyac out back next to the back porch.This is the third time we have stayed in this condo.Last year we used the kayack three or four times.Our thought was that it came with unit ,just like the chairs and umbrella .I did take the kayak out one time for about 30 wife would not go because there was no life jackets.That was the only time it was used.All she had to do was Knock on the door or leave a note.I thought her actions were very unprofessional.If it is not to be used,it should not be in the picture displaying the property and should be chained up or a note or something.Other than that our trip was great. We have been coming to Wild Dunes for 20 - 25 years on and off and have often stayed at Port O Call. Although all the units are well located, B101 was the best being right on the beach. The unit was nicely decorated an updated, especially the bath. Being on the first floor was, on one hand, great as we could walk out directly onto the beach. The downside is that one has upstairs neighbors, who in our stay had several young children whose constant running around was rather noisy. If that bothers you, consider a level 300 unit which also come with an upper deck on the roof. The rental experience through Island Realty.was great. We booked. Somewhat at the last minute yet everything was accomplished with little effort... at least on our part. We have used IR several times and have always had a great experience. They have arrangements for late check-in which allowed us to go directly to Charleston from the airport for an event we had scheduled. My only request would be for the to again offer the coupons for discounted golf in the area. We were originally booked in a different building on the second floor but were moved to B101 because a situation with the unit. This was an upgrade at no cost to us,which turned out beautifully. The reservation process as well as check in and check out went smoothly. We would book thru Island Realty again in the future. Glad to hear you all enjoyed your stay! The unit was wonderful, as was the view of the ocean. I had broken my arm 2 days prior and wasn't able to do much, but I certainly enjoyed the water. we'll come back...we meant to leave a note to let you know the shower drain is VERY slow may need to be snaked. We usually stay in Seagrove, but I may like this better. It's very quiet. So glad to hear you enjoyed the condo and the Port O'Call complex! Thank you for letting us know about the shower drain. We will make sure that is remedied! Hope you have a speedy recovery!! We thoroughly enjoyed our time on Isle of Palms. This unit was nicely furnished and comfortable.The location directly on the beach was superb. We would return. One of the most relaxing and enjoable vacations we have had in a while. We love Charleston and we will be back next year. The condo had exceptional views of the beach. You want right out and down about 5-6 steps and you are right on the sand. The weather was not that great the last 4 days we were there, but there were other things to do. The condo is perfect for a couple.I would definately return. We throughly our time spent at Port 'O Call. B101 is a wonderful unit with Ocean views from every window. Loved walking out the screened in porch to the beach. Unfortunately, you can't lock the unit unless you walk out the front door. The oven / stove really needs to be replaced. We made due, but only one burner worked. The other annoyance was the fan in the bathroom because it is connected to the major source of lighting, but I'm nit-picking here. I would go back in a nano second. The beach was gorgeous and the water was warm. We loved its proximity to Charleston, and the local restaurant Morgan's Creek. I highly recommend Port O Call on the Isle of Palms, and I am a very picky traveler.